SDI Presence LLC released its review of BOMA International 2017’s New Office Measurement Standards, identifying modifications to the standard that can change a building’s current Rentable Area. “With the accounting of every conceivable portion of a property, BOMA 2017 makes for a much more involved calculation process, but results in greater transparency for tenants, leasing agents and ownership,” states SDI Commercial Real Estate General Manager Bob Ladner. 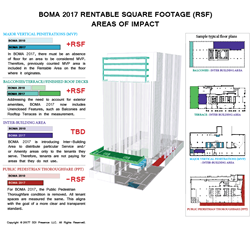 Last updated in in 2010, this BOMA methodology is considered the indisputable standard for measuring buildings’ rentable square footage (RSF) in the United States, Canada and internationally. As the 2010 method, the new 2017 standard allows for an alternative method of measurement that provides a full building load factor rather than a floor-by-floor load factor, especially helpful when a building has wide variations in floor occupancy (such as floors featuring building amenities, or buildings with a wide disparity in actual floor sizes). The standard also explicitly allows for the use of standard corridor configurations throughout a building. Major Vertical Penetration area can be included on originating floor. Measurement now includes unenclosed features such as balconies, terraces and finished rooftop decks. Introduction to Inter-Building areas to distribute services and/or amenity areas to the tenants. Public Pedestrian Thoroughfare condition is removed. “If you are preparing to buy or sell a property, or lease several contiguous floors to a single tenant, you may benefit from an updated measurement,” states Ladner. SDI helps building owners and managers maximize the leasing revenues, operational efficiencies, and security of their properties. Trusted by the nation’s top real estate developers, owners, and managers, SDI has assessed over 200M square footage of properties across the United States, adding over $285M in potential annual revenue for our clients. IT services integrator SDI delivers technology managed services, business consulting and infrastructure solutions to achieve IT performance expectations while advancing our clients to a digital enterprise. With a 20-year corporate resume, SDI helps our clients meet rising customer expectations, enhance security, and capture revenues. SDI is a certified Minority Business Enterprise (MBE), with a portfolio of clients that includes some of the nation’s largest airports, utilities, commercial real estate portfolios, and government agencies. SDI delivers a deep technical presence through a local delivery model to achieve customer confidence and success. Visit us at http://www.sdipresence.com and follow us on LinkedIn and Instagram at SDI Presence and Twitter using @sdipresence.